The coast of South Africa is home to one of the world’s largest populations of great white sharks. Sharks feast on seals and thus can often be sighted near one of the many seal colonies along the South Africa shores. Although the sharks are present year round, a sighting is never guaranteed. 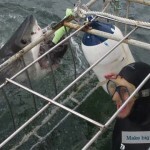 With so many sharks in South Africa, cage diving has become one of the most popular tourist activities in the Cape. 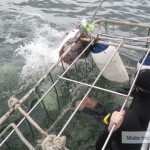 While researching things to do in Cape Town, I found a highly rated outfitter offering cage diving from the marina at Simon’s Town, a small town just outside Cape Town. With minimal hesitation, I secured the only two spots available in the coming week. I was feeling lucky and a bit excited about our excursion and the prospect of seeing a great white shark up close in its natural habitat. However, I wasn’t fully committed to getting in the water with these giant creatures. I’m not fond of any sort of fish in the water while I’m swimming, and everything that I read said the best viewing spot was from the boat! So I felt like I could go on the excursion and watch safely from the deck of the boat. Unfortunately, due to weather and adverse sea conditions our initial tour was cancelled. We re-scheduled for two days later, but unfortunately it was cancelled too. Our time in Cape Town was running short and we sadly couldn’t reschedule. We still really wanted to see the sharks, so we had to look for an alternate plan. Mossel Bay is a popular destination on the famed Garden Route. There’s a seal colony less than one kilometer off shore which also means there’s a healthy population of great white sharks! We planned to pass through Mossel Bay on our road trip in the western cape, so we decided to make a booking. We hoped the third time would be the charm! If the trip were to be cancelled, we’d have to move on and skip shark diving altogether. When we arrived in Mossel Bay, the sky greeted us with clouds and the weather forecast called for rain. Nonetheless, we received a confirmation from the tour company that our tour would still depart in the morning. We went to bed a bit skeptical and woke up early to the sound of rain. Ugh! The wet weather added to my uncertainty about the whole adventure. The intermittent downpours and a late 11:00 am departure did little to calm my anxiety. And with the colder weather, I was even more certain that I didn’t want to get in the water. I would be content watching them from above and trying to stay dry. As we made our way onto the small boat (named “Shark Warrior”), we settled in for the soggy trip out into the bay. We’re glad we didn’t have far to go. Seal Island was only ten minutes away and we quickly anchored just off the shore of the small, rocky island. The crew mixed up some chum and slung it into the water to attract the sharks. From that point, it was a waiting game to see if any great whites would appear. In a matter of minutes we had our first sighting. We could see the mysterious shadow of a single shark circling the boat! The crew lowered the scratched and dented cage into the water and secured it next to the boat. The skipper began handing out wet suits calling for the first six volunteers. It all happened so fast and the next thing I knew, I was holding a wet suit in my hand and getting instructions to keep the zipper in the front. I slowly peeled my warmer layers until I was down to just my swimsuit. Brrr … this was going to be cold! I pulled on the clammy wetsuit and waited for the neoprene to warm up with my body temperature. There were no guarantees that the shark would stay around the boat, so the crew tried to get people in the water as quickly as possible. With a look of panic on my face, I moved towards the cage and lowered myself into the water. The poor “muscle man” next to me had to help me find the bar at the bottom of the cage where I could place my feet and keep my head above water. A few shivers and some deep breaths followed as I continued to rationalize what was happening and devise a plan to not lose a finger or a toe! 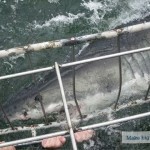 At that moment, when I was sitting in the cage bobbing up and down in the waves and trying to calm myself, I secretly hoped the shark wouldn’t stay around the boat. I felt cold and uncomfortable, especially with the muscle man who began to encroach on my space in the cage. Every time he stuck his head into the water, his elbows flared out and blocked my space. After about ten minutes—with no sharks—the crew called us all to exit the cage. The boat had started to drift towards the island and they needed to re-position the boat. Once back in the boat, I felt somewhat relieved. At least I had given it a go, right? But, once we were safely relocated a further distance from land, the skipper directed us back into the water. I reluctantly wedged myself back into the cage. This time Kevin was on my right and I had a woman to my left. I felt relieved that I wouldn’t have to contest for space with the muscle man. 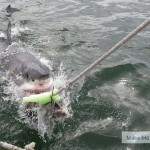 After returning to the cage it wasn’t long before a few sharks came for a visit. The tour guide yelled, “Diver’s heads down, look right!” Every time a shark approached this is what the guide would yell to instruct us where to look. I stuck my head in the water and the the next thing I knew, there he was … a great white shark with his mouth wide open directly in front of me! Whoa! 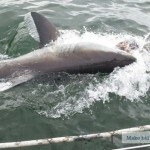 After a few sightings, it was time to exit the cage to let the others on the boat see the sharks. As we left the cage, the guide said there was room for two people to stay. I immediately passed, but Kevin jumped on the opportunity to have another round with the sharks. The new divers secured themselves in the cage and an impressive “round two” began. 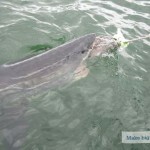 The crew continued to lure sharks closer with bait and several sharks collided with the cage and thrashed above the water trying to rip the bait from the lure line. I must say that I was happy to observe (and take photos) from the edge of the boat. I was able to get quite a few great pics that we never would have had if I had stayed in the water. Now that it’s over, I am glad that I decided to give it a go and get in the water. It was definitely a once-in-a-lifetime experience. However, I must admit that I much preferred playing the role of photographer from inside the boat. So, if anyone out there wants to see sharks but is fearful of getting in the water, I’d still advise you to take a shark diving tour. You can see everything you need to see from the boat. It’s a memorable experience that I will not soon forget.